If you’re like many other high school or college students, you probably feel pressure to perform at a high level-both in the classroom and on the field. Unfortunately, this pressure can cause lots of stress and anxiety. To make matters worse, you may find it difficult to effectively manage all of these demands on your time, energy, and health. This is where mindfulness can help. 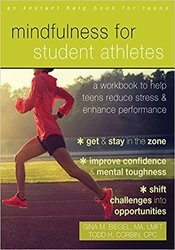 The mindfulness skills outlined in this workbook will not only help you on the field-but in life as well. You’ll be able to take what you’ve learned and apply it to any situation, from job interviews to scoring a touchdown. What a gift to have!